If you're following a low carbohydrate diet, it's very likely you know how medium chain triglycerides (MCTs) can help you in achieving your healthy lifestyle goals. MCTs require exacting laboratory conditions to ensure you get the full benefit from the oils. MCTs are an important part of our diet, but they are largely missing from most dinner tables. Nutritionally speaking, the oil and powder form from a quality product should contain the same fats and MCTs. However, some of the powder forms will contain more sugar than the oil forms. Because of this, it's important to check the nutritional information of any powder that you purchase. In the past, the powder forms used maltodextrin in the formula, but now it's possible to find powders without extra sugar. The powder may be more useful for cooking. The form you choose depends largely on how you want to use and store the product. The liquid form is generally best preserved through refrigeration after opening. The powder form doesn't need to be refrigerated to maintain the nutritional content and quality. The oil form doesn’t contain any starch, starch derivatives or milk proteins, which is a necessary component of the drying process for powders. Even though the MCT Oil and Powder forms are virtually identical, it's not a bad idea to keep both forms around for various purposes. The powder form is easier to take with you when traveling and it won't make a difficult to clean mess if it leaks or spills. The powder can also be used in cooking and mixes well with powder ingredients that you may use in your keto foods. Paradoxically, liquid MCTs don't always mix that well and the liquid may float on top of your drinks. With the powder form, you're more likely to get a better mixture with a bit of texture, but the oil form is essential for people who love their bulletproof coffee. Using the powder form may also be easier on the stomach, as it tends to be more easily digested. Some people also feel that the powder form helps keep them full longer. Still, many people prefer the oil form since it doesn't have to go through the additional processing that the powder must endure. Typically, the powder form may contain maltodextrin, glucose syrup solids, sodium caseinate, soluble corn fiber or soy lecithin. Any of these components may add to the carbohydrate and protein content. Dominic D’Agostino is a researcher at the College Of Medicine Molecular Pharmacology and Physiology at the University of South Florida, and he notes that blood ketones can be doubled by using the powder form instead of the oil. Mostly, this is due to the level of tolerance that the powder form provides. Most research has focused on the use of MCT oil and not the powder. However, there is no reason to suspect that the powder form is any less nutritious or effective. The main difference is in the method of delivery. As mentioned earlier, you also have to ensure that you get a powder form that doesn't include unhealthy ingredients that are designed solely to improve the taste or texture. For coconut oil that has been cold-processed and not hydrogenated, the recommended daily dose is up to 30 grams or about one tablespoon of the oil. One tablespoon of MCT should provide about 115 calories. Care needs to be taken to avoid taking too much when you first start adding the oil to your food. It's suggested to start with a dose of about 7 grams and work your way up to 30 grams as you build tolerance. Any serious keto-dieter should have a gram-based scale available to accurately track all of their daily servings. It's also important to avoid heating these oils for long periods of time as this can destroy some of the nutritional content. While side effects can be lessened by taking small doses at first or using the powder form, there are some side effects to be aware of. MCTs can cause an upset stomach, diarrhea and indigestion. Uncommonly, nausea, irritability, gas and vomiting may occur. Taking too much of the oil could also contribute to weight gain, but this is less likely on a keto diet. The mode of operation for MCTs is more like a carbohydrate than a fat, and they can be used by the liver for energy. However, like carbohydrates that operate in the same way, they can cause weight gain if that energy isn't expended. The product contains 100 percent pure oil, and it is made using a process that is designed to maintain the most nutrients. It contains the right kind of oil that you need to enjoy the most benefits. MCT oil actually comes in several different types, and the least expensive kind of oil is the C12 oil. When you take this oil, you'll feel an increase in energy, your mind will feel sharper and you'll have more energy to last the day. 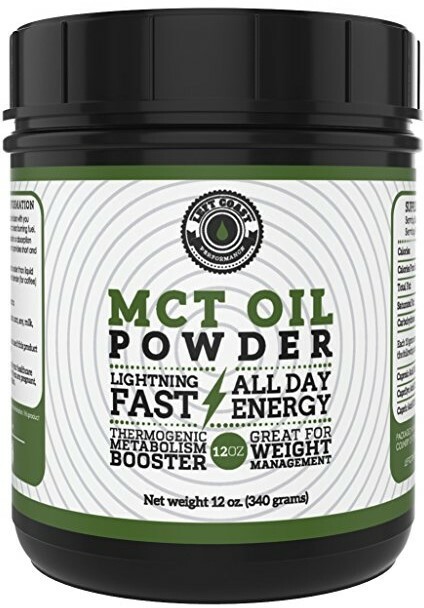 MCT oil is an essential fat for anyone who is on a keto diet, and it works in a very similar way to carbohydrates without any of the side effects that come from weight gain. 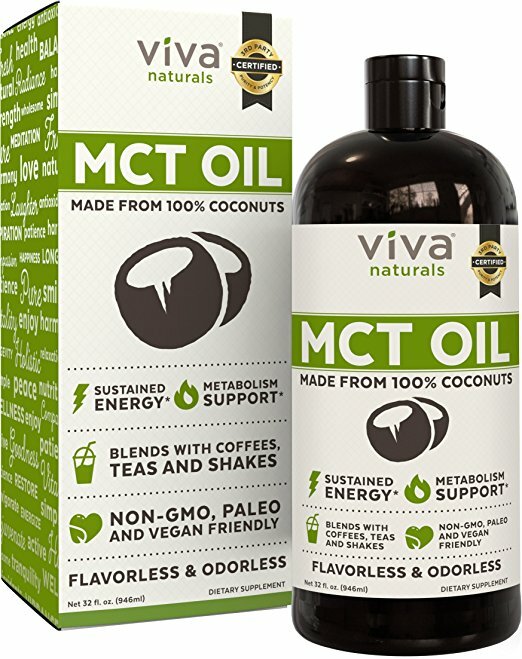 The MCT oil market is fraught with low-end products so it's refreshing to find one product that lives up to the hype. Now Foods is a well-respected supplement manufacturer that has been endorsed by the Alliance for Natural Health USA. The pure oil may cause stomach upset in some individuals. For the most purity, this oil will give you an easy to absorb and digest product from a trusted company. The oil is made using a triple filtered process to ensure you get only the purest form of the oil. The company uses a low-heat process that takes a considerable amount of time. The result is a product that is pure and clean so that you get a highly nutritious product. The company regularly looks for heavy metals or impurities that might have contaminated the oil. This adherence to strict standards makes this company stand out in a highly competitive MCT oil market. The container is completely BPA-Free. Oil is derived from pure coconuts. Each batch is tested for impurities. No mention of the type of caprylic acid used in the product. The Viva Naturals MCT Oil tests all of their batches for any impurities, and this is one of the few oils out there that is certified to be gluten-free, vegan and paleo diet approved. The product is made in facilities within the U.S., and they use third-party testing companies to ensure purity and potency. The oil is considered to be of pharmaceutical-grade due to its intensive filtering process. The company was previously known as Viva Labs, but the name was changed to reflect the company's dedication to providing natural and healthy supplement products. This particular oil seems to have caused less discomfort for people who are sensitive. It's a good option for people who have sensitive stomachs and want to use the oil instead of the powder form. Oil is derived from coconuts that have been sustainably harvested to ensure you have the healthiest product. The product contains 100 percent capric and caprylic acid, and it is odorless and tasteless. The oil is free of pesticides and residue. Easier on the stomach than most oils, but it still may cause some stomach discomfort. 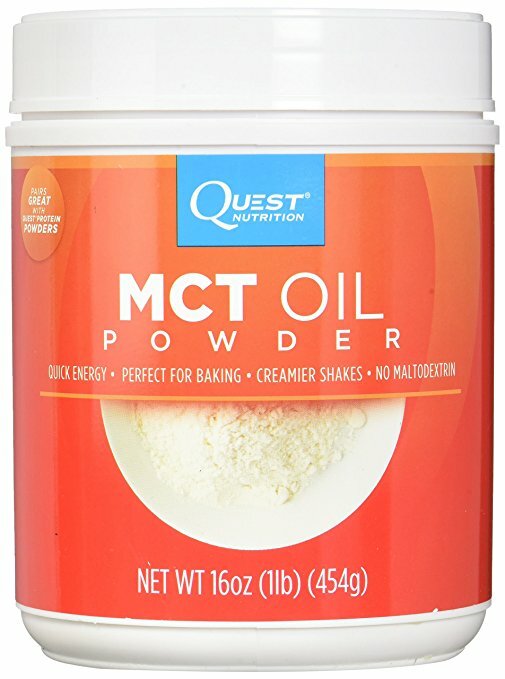 If you're looking for a quality MCT oil powder, Quest Nutrition has one of the best products available. The product also doesn't contain any maltodextrin, which would increase the sugar content. Since it is a powder form, there are a few extra ingredients to help with the drying process, including soluble corn fiber, sodium caseinate, sunflower lecithin and silicon dioxide. Since the product contains milk-derived ingredients, it may not be the ideal choice for everybody. Unlike pure oil, the powder does have one gram of carbohydrates for each 9 gram serving. The product provides the same amount of MCTs, but you'll likely want to use more of the powder to get the same level of potency. It contains pure MCT oil and they actively avoid the use of any unhealthy substances that may reduce the quality of the oil. For keto dieters, this is the best powder form available. Question Nutrition is a highly-respected brand. The company states unofficially that the product is made from non-GMO ingredients, but they do not yet have a certification on their product labels. 1 gram of carbohydrates per serving. This product is a last-resort option for keto dieters. It contains too many carbohydrates to be used regularly on a keto diet. Since there are 4.8 grams of carbohydrates per serving, it may boost you above what your daily carbohydrate goals are. The good news is that the serving size if 10 grams, which is 3 grams more than the Quest Nutrition MCT Oil Powder. However, you're still ingesting significantly more carbohydrates with this product. All three of these are desirable in a coconut oil, and it ensures you're getting a supplement that is pure. The product does contain maltodextrin, but that's also why this product is easier on the stomach. The powder contains C6, C8, and C10 caprylic acid. This is the best product for people who experience stomach discomfort. Contains 4.8 grams of carbohydrates per serving. The product contains tapioca maltodextrin. Now Foods is listed on the Alliance for Natural Health USA approved companies list, which makes the company a safe choice for any supplements. Now Foods MCT Oil also has nothing else added to the mixture, which makes it an ideal supplement for people who are on a keto diet. The oil has 100 calories per serving and 14 grams of fat. and it serves as the perfect oil for adding to your coffee and other keto-approved meals. It's a trusted brand, and it's made using cold processing to preserve the valuable nutrients.